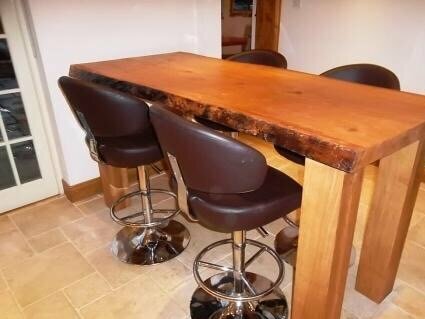 A bar height kitchen table is a useful and practical addition to any kitchen, the height of these tables is the same height as your kitchen worktop height and that is 900 mm to the top of the table. The height can range between 900mm to 1070mm depending on preference. 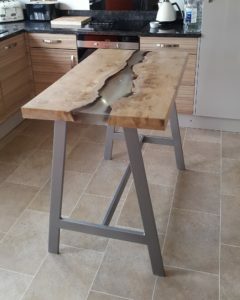 If you are limited for space in your kitchen and have always longed for a kitchen island to compliment your worktops and give you extra work surface then a bar height table solves this issue. Not only is it a dining table combined with a breakfast bar it is the perfect height for a kitchen island. For durability there is no better English timber than oak, a much harder surface than some modern composites used for islands, with the added advantage that if needed can simply be revarnished or oiled. However as we have such a large selection of wonderful English hardwoods, other tops would work equally as well. Probably one of the most versatile items of kitchen furniture we have had the pleasure to make. Kitchen table heights vary, the height of a standard table is between 28 inches and 30 inches and a counter-height table is usually between 34 and 36 inches high. 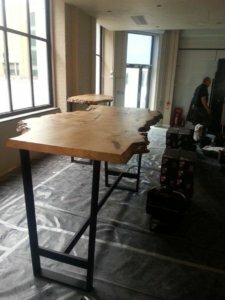 Some counter-height tables, known as bar tables, are even taller(sometimes called bar height pub tables) at between 40 and 42 inches high. 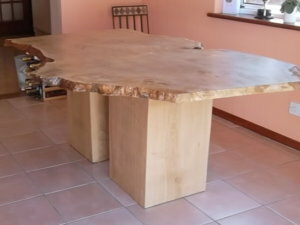 So if your at wits end regarding kitchen surface area contact us via the page or give me a call and we will be more than happy to work with you to produce your own bar height kitchen table.